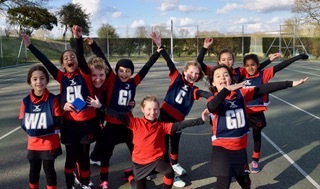 After the artic weather last week the girls were in high spirits to get back onto the netball courts. accuracy of passes. Their teamwork was fantastic as they spread across the whole court allowing for players to drive into space. Sienna and Clara worked superbly together within the shooting circle, scoring another 6 goals. In the second half the girls changed positions and although they had the majority of the possession it took a while for a goal to be scored. In the last five minutes of the game the girls were once again looking for space and driving in front of the opposition. The centre court players worked hard together to bring the ball down the court into shooters Amelie and Cassia to bring the final score to 16-0. A great game girls! Well done to Cassia, Maryam, Melia, Ann, Camillia, Sienna, Clara (Captain), Amelie. A special mention to Sienna who was awarded player of the match for her superb shooting and excellent movement off the ball.